Degrees and certificates are not automatically awarded (except Pathway Certificates) to those that complete their program requirements. You must apply to graduate. Degrees and certificates are awarded at the conclusion of each term. To receive any degree from UCC, you must maintain a 2.00 cumulative grade point average, attend UCC for two terms (including the last), and complete at least 25 percent of the program requirements at UCC. If you are earning a second associate degree, you must complete a minimum of 24 credits in addition to those completed for the first degree. If you are earning a second certificate, you must complete a minimum of 12 credits in addition to those completed for the first certificate. You will only be charged once for the graduation application fee. UCC automatically awards Pathway Certificates upon completion of requirements at the conclusion of each term. To opt out of an automatic award of a Pathway Certificate, submit a completed Graduation Application Change Request (with the OPT OUT box checked) to the Registrar's Office in the Laverne Murphy Student Center. It is your responsibility to apply for graduation to ensure that all requirements are complete. For June graduates, the application should be submitted by the end of January of the year in which the certificate or degree is to be awarded. In-person. Visit the Registration and Records Office to complete a paper application. When should I apply for graduation? Apply for graduation one full term before the expected completion term. This gives you enough time to make any required adjustments once we evaluate your application. Example: Graduating spring term - File for graduation in winter term. What happens after I apply for graduation? The evaluation can take up to four weeks. Usually the normal processing time is two weeks depending on the time of the year. Breaks and vacations can alter this time. When will I receive my actual diploma? 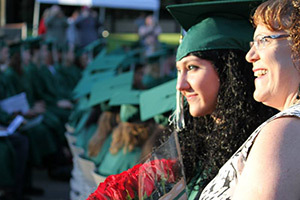 Diplomas are mailed out within six weeks AFTER the completion of the term for all graduating students. What if my Graduation status changes? If you need to make any changes to your original Graduation Application, fill out a Graduation Application Change Request and return it to the Office of Registration and Records. Friday, June 14, 2019, 6 p.m.
Commencement is a ceremony that allows students, family, and friends to celebrate the student’s academic accomplishments. Commencement will be held outdoors regardless of the weather. Graduates need to arrive at the Gym in the Athletics Complex by 4pm for the official line-up and to take the class photo. Students arriving late will be placed at the end of the line! Students must arrive by 4 p.m., Friday, June 14 at the Gym in the Athletics Complex to participate in the ceremony. Participation in the commencement ceremony is optional. However, we encourage you to attend the ceremony to celebrate your achievement. Return the participation reply card to the Office of Registration and Records in the Laverne Murphy Student Center before Friday, May 10, 2019! Monday, June 10, 10 a.m. - 2 p.m.
Tuesday, June 11, 10 a.m- 2 p.m. If you have an accumulative GPA of 3.75 or higher at the end of Winter term, you are eligible to wear the honor stole during the commencement ceremony. Honor stoles will be distributed at the Office of Registration and Records on Monday, Tuesday and Wednesday, June 10, 11 & 12, 2019. The honor stole MUST BE RETURNED to the college after commencement by Monday, June 17, to the office of Registration and Records or a $30 fee will be placed on your student account and your transcripts will not be available for release. The ceremony is to acknowledge your anticipated completion of your degree and does not mean you have graduated. The name you provided on your Graduation Application will be the name printed on your diploma. Your diploma or certificate will be mailed to you within six weeks AFTER the completion of the term. A diploma cover will be given to you as walk across the stage during the ceremony (This will NOT contain your actual diploma). Graduates not participating in commencement may pick up their diploma cover at the Office of Registration and Records on the following Monday, June 17. Cap & Gown Pick Up Bookstore Monday, June 10, 10 a.m. - 2 p.m.
Cap & Gown Pick Up Bookstore Tuesday, June 11, 10 a.m- 2 p.m.
Cap & Gown Pick Up Bookstore Wednesday, June 12, 10 a.m- 2 p.m.
Captivating Photography (optional) Laverne Murphy Student Center Lobby Friday, June 12, 10 a.m. - 3 p.m.
Graduate's Official Line-up Gym (Athletics Complex) 4 p.m.
Processional Begins Swanson Amphitheater 6 p.m. Reception Center of Campus (Compass) 8 p.m.
Return Honor Stole (if applicable) Gym (Athletics Complex) 8 p.m. Rain or shine, UCC will hold it's annual commencement ceremony outdoors at the Swanson Amphitheater. The ceremony will start at 6 pm with the graduates entering the amphitheater. At the end of the ceremony, the recessional will begin (about 8 p.m), where all graduates, friends, family, and faculty are welcome to celebrate at the Campus Center Compass. In the event of severe inclement weather, the ceremony will be moved to Jacoby Auditorium and tickets will be necessary for attendance due to limited seating. Each graduate will receive (2) tickets for their adult guests. Seating (approximately 1,000 chairs) is available on a first come, first served basis. An area will be cordoned off for persons in wheelchairs. Two grassy areas on either side of the seating area will be cordoned off for those wishing to use blankets. Arrive early to allow extra time for parking and for a UCC usher to direct you to a seat (if needed). Any guest needing additional accommodations, please contact our Security Office at 541-440-7794 prior to the event. 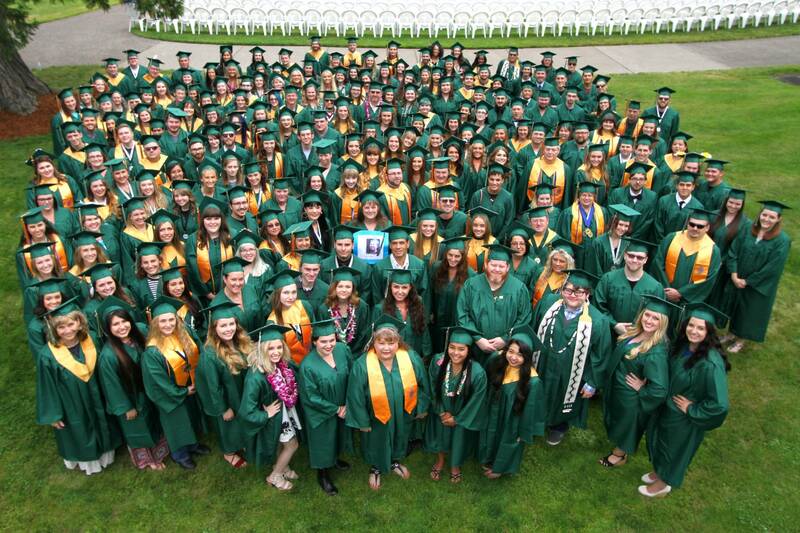 If immediate assistance is needed during Commencement Day, please contact our security officers at 541-440-7777. 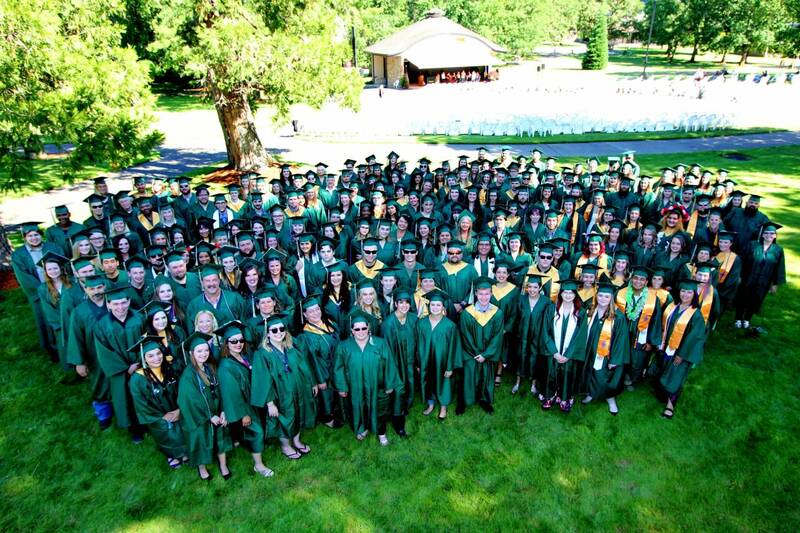 Any graduating student needing accommodations, please contact our Accessibilities Services prior to the event at 541-440-7655. Being involved with the college doesn't have to end because you graduate! We invite you to become an active member of the Alumni Association. As a member you can participate in a variety of activities including fundraising, scholarships, athletics, special events and much more. Plus, we'll keep you informed about everything UCC. All members receive the quarterly Hawk Squawk eNewsletter.